Turn on the television. Every channel, from cable to public television is touting the virtues of blending indoor and outdoor spaces. 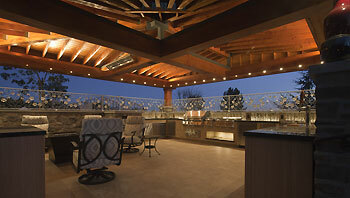 Outdoor kitchens, living spaces, even showers and baths are now desirable components of the outdoor landscape. You wonder, “Can roses we love still be part of this plan?” Absolutely! Let me share some of the ways climbers, miniatures and traditional rose plants upgrade while updating our garden spaces. Partitioned living spaces is a popular design trend in creating use-dedicated living spaces. You do not need to build a solid structural wall to divide spaces. Climbing plants decorating a trellis or other open structure is not only easier, but the informality is more appropriate for modern living. 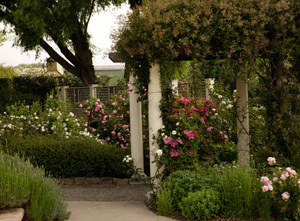 Climbing roses, even when not in full glory, the tracery of the stretching canes covered in dense green foliage provides artistic interest and the comforting sense of envelopment. There is a climbing rose to satisfy anyone’s personal taste. There are the traditional solid color blooming climbers. The wine-purple blooms of Night Owl, the cherry-red All Ablaze or the buttery-yellow Sky’s the Limit, each cultivar flying its color against a background of healthy green leaves. For a bit more flash, you may prefer planting up some of the more fanciful flowering colorations. All-America Rose Selection winner Fourth of July lasts well past its namesake month with dazzling red strips on white. The blooms open wide, revealing a blockbuster burst of bright yellow centers. Candy Land serves up rosy pink swirled with cream. Weeks Roses newest striped introduction, Purple Splash, features similar stripes but with a darker, purple color. Arriving in big clusters, these flowers open up to splash your garden with loads of color. When dividing a yard into separate areas, the living spaces are frequently not as ‘wide open’ as once was in vogue. This requires using smaller plants to optimize limited space. 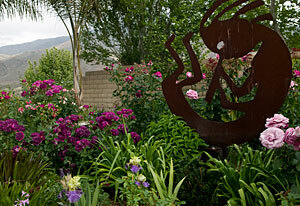 Consider the advantages of using miniature rose bushes and shorter height rose trees. From the light toned, lemonade yellow Lemon Drop to the darker smoky orange ringed in purple Smoke Rings there are many choices to match every color palette. All a’Twitter is a brand-new mini with an eye-searing orange color that looks stunning in a container or in the landscape. Frequently, areas need to be divided, but the view needs to be unobstructed. 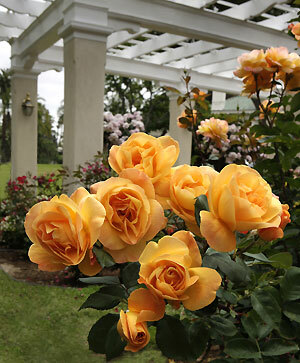 Using Floribunda roses with a more natural compact growing habit accomplishes this very well. The ever-blooming Julia Child always draws attention with her beautiful butter-toned, incredibly fragrant blooms without wandering around the yard. This AARS winner also supplies great contrasting green backdrop color with clean mean disease resistant foliage. Cinco de Mayo supplies more earthy hues with a smoky blend of rust red-orange and a hint of lavender, giving clusters of color that can flow with many landscapes. Topsy Turvy is also a great small space workhorse with bright hues of scarlet & white. Used en mass along a border this rose, along with many others, creates a natural border that discourages cut through traffic – thorns have benefits! Take a look at the Week Roses Web site. There you can search by color and type of rose at your leisure. This online resource matches each rose with information about height, habit, bloom size and fragrance. 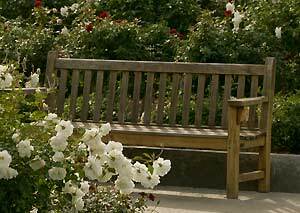 While you are there, look for links to other resources for the rose enthusiast.